This warning message illuminates if you try to turn off the engine without the shift lever in P (Park) position. At this time, the Engine Start/Stop Button turns to the ACC position (If you press the Engine Start/Stop Button once more, it will turn to the ON position). 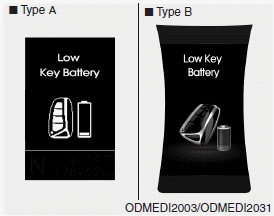 • This warning message illuminates if the battery of the smart key is discharged when the Engine Start/Stop Button changes to the OFF position. 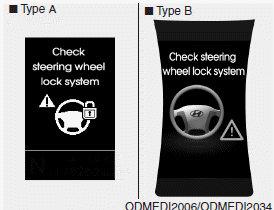 This warning message illuminates if the steering wheel does not unlock normally when the Engine Start/Stop Button is pressed. 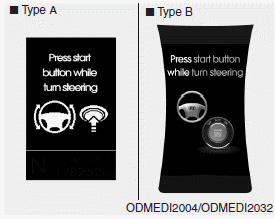 It means that you should press the Engine Start/Stop Button while turning the steering wheel right and left. • This warning message illuminates if the steering wheel does not lock when the Engine Start/Stop Button changes to the OFF position. • This warning message illuminates if the steering wheel does not lock normally when the Engine Start/Stop Button changes to the OFF position. 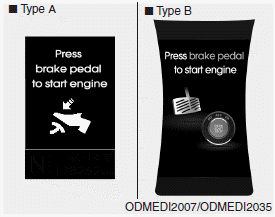 This warning message illuminates if the Engine Start/Stop Button changes to the ACC position twice by pressing the button repeatedly without depressing the brake pedal. It means that you should depress the brake pedal to start the engine. This warning message illuminates if the smart key is not in the vehicle when you press the Engine Start/Stop Button. 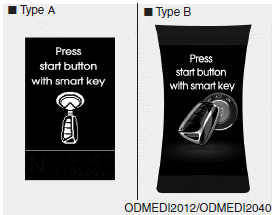 It means that you should always have the smart key with you. 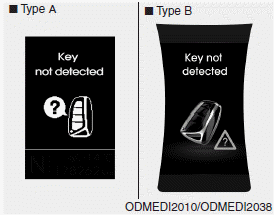 • This warning message illuminates if the smart key is not detected when you press the Engine Start/Stop Button. This warning message illuminates if you can not operate the Engine Start/Stop Button when there is a problem with the Engine Start/Stop Button system. 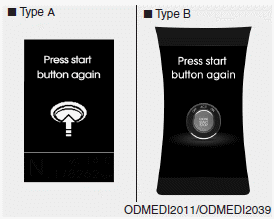 It means that you could start the engine by pressing the Engine Start/ Stop Button once more. 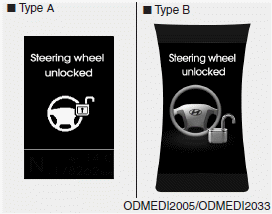 If the warning illuminates each time you press the Engine Start/Stop Button, have your vehicle inspected by an authorized HYUNDAI dealer. This warning message illuminates if you press the Engine Start/Stop Button while the warning message “Key not detected” is illuminating. At this time, the immobilizer indicator light blinks. This warning message illuminates if the brake switch fuse is disconnected. It means that you should replace the fuse with a new one. If that is not possible, you can start the engine by pressing the Engine Start/Stop Button for 10 seconds in the ACC position. • This warning message illuminates if you try to start the engine with the shift lever not in the P (Park) or N (Neutral) position. 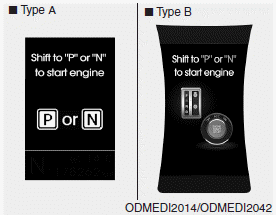 You can start the engine with the shift lever in the N (Neutral) position. But, for your safety, we recommend that you start the engine with the shift lever in the P (Park) position. • It means that any door is open. • It means that the tailgate is open. 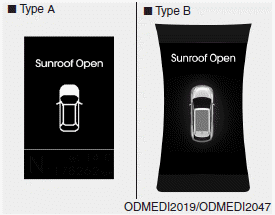 • The warning message illuminates if you turn off the engine and then open the driver's door when the sunroof is open. This warning message illuminates if you start the engine when the steering wheel is turned to more than 90 degrees to the left or right. 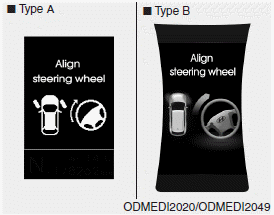 It means that you should turn the steering wheel and make the angle of the steering wheel be less than 30 degrees. This warning message illuminates on the service reminder mode if the washer fluid level in the reservoir is nearly empty. It means that you should refill the washer fluid. This warning message illuminates if the fuse switch on the fuse box is OFF. 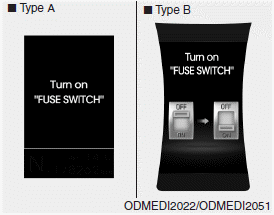 It means that you should turn the fuse switch on. For more details, refer to “Fuses” in chapter 7. • It means that the fuel filler cap is not tightened securely.